An omelette wrapped in cellophane waiting to be sliced into rounds for a room temperature treat at luncheon. Inside: sautéed mushrooms, onions and hot oil marinated red pepper strips. Sprinkle with freshly cracked pepper and something green before serving. Goes well with a green salad and crusty bread. It’s summer, might as well have a little rosé to drink, too. 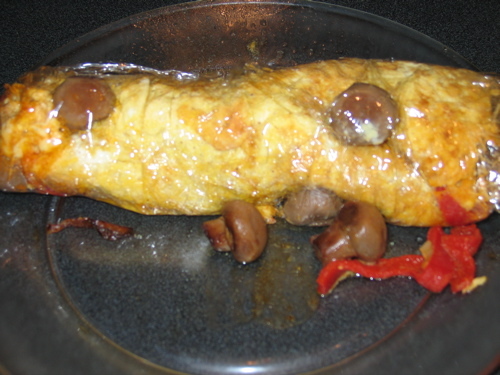 This entry was posted in Entertaining and tagged Omelettes, recipes. Bookmark the permalink. BTW–thanks for the heads-up on Cristalino awhile back, speaking of rosé. CL, yikes! You’ve reminded me that we are out of bubbles and rosé both. An unforgivable situation in summer, and luncheon fast approaching!